Will A Movement Emerge From Florida Teen's Death? 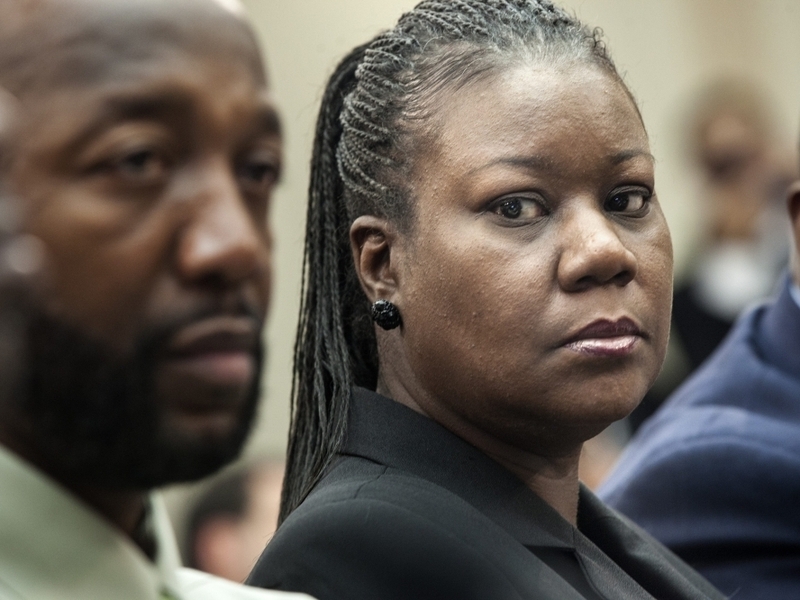 As Trayvon Martin's parents lead the calls for an arrest in their son's killing, their lawyers have hired a marketing firm, and efforts are under way to establish a nonprofit foundation. Supporters say they want to protect others from injustice. Will A Movement Emerge From Florida Teen's Death? 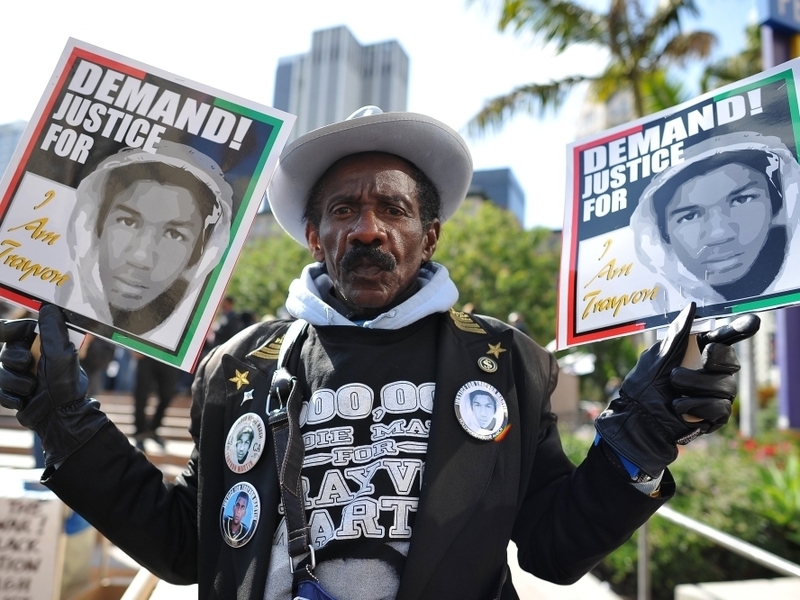 A man joins nationwide protests in memory of slain Florida teenager Trayvon Martin, in downtown Los Angeles on Monday. In the wake of the shooting death of Florida teen Trayvon Martin, his parents have led a national call for the arrest of gunman George Zimmerman. Meanwhile, their lawyers have hired a marketing firm. Trayvon's mother is trying to trademark two popular slogans that contain his name. And the family is establishing a nonprofit to handle donations from supporters. In some ways, these may seem like unusual steps for parents still reeling from the death of their child. But supporters say their efforts are part of a strategy not only to ensure that Zimmerman is convicted, but also to build a platform for broader advocacy. "Trayvon was my child. Trayvon was your child," Trayvon's mother, Sybrina Fulton, often says at rallies and news conferences. "I'm going to make sure this never happens to anybody else's child." Trayvon Martin's parents, Tracy Martin and Sybrina Fulton, listen during a forum of Democratic members of the House Judiciary Committee on Tuesday. It's a fledgling effort with a mission that is unclear, beyond protecting "young men in America against injustice," says a lawyer for the family. Others aiding the family say the cause could target problems that plague African-Americans who encounter the criminal justice system, including racial profiling and inadequate legal representation. To be sure, the facts of the Feb. 26 shooting in Sanford, Fla., remain in dispute as the state's investigation continues. Zimmerman, a 28-year-old neighborhood watch volunteer who encountered the 17-year-old walking through a gated community, hasn't been charged with a crime. He maintains he shot Trayvon in self-defense after the teen attacked him. Trayvon's parents believe their son was murdered. The fact that Zimmerman remains free after shooting an unarmed African-American teen has ignited outrage and accusations of racial profiling. That groundswell, heard in protests across the nation, as well as the support of civil rights leaders, celebrities and politicians, has encouraged Trayvon's parents and their lawyers to bring organizational structure to their fight. "Our supporters really keep me and my family going with this," Trayvon's father, Tracy Martin, said in an interview. "This is big." Martin has pledged to help fight for justice for cases beyond his son's killing. Fulton has applied to trademark the phrases "Justice for Trayvon" and "I Am Trayvon." With the trademarks, she could authorize use of the slogans in various digital media formats. Trademark holders also can charge a fee for such use, and the applications have raised questions about whether Fulton may look to profit. Family attorney Daryl Parks said she is only trying to protect her son's image from exploitation. "She's not trying to make money off of it," he said. "She wants to control her son's image. We don't want what we're fighting for to be misused." Trayvon's image and related slogan are ubiquitous. At protest demonstrations last week in the city of Sanford, where the teenager was killed while wearing a hooded sweatshirt, vendors sold Trayvon T-shirts and hoodies. The slogans have been trending topics on Twitter. A Facebook search finds nearly a dozen group pages titled "Justice for Trayvon" or "I Am Trayvon." Other efforts have raised the kind of concerns Fulton hopes to head off. A recent fundraiser for the family at the Roxy Night Club in Orlando featured the theme, "Hoodies and Heels: Justice for #TrayvonMartin." Admission and drinks were free until midnight. Blogger Awesomely Luvvie slammed the party as "crass": "You greedy opportunists! How is a night at the club supposed to bring justice for Trayvon?" In a movement gaining momentum quickly, Parks acknowledges they could lose control of the effort without the help of supporters with a range of expertise, from attorneys to grassroots organizers. The family is in the process of establishing a nonprofit foundation. Parks said he advised the family to set up a foundation in part to handle the volume of mail containing checks and cash donated to the family. Some parents are motivated to take action by the sheer agony and pain and torture of losing a child. And at rallies and church services, thousands of dollars have been pledged to help the parents cover travel and other costs while they aren't working. At one rally in Sanford last week, collection buckets were passed through the crowd at the urging of the Rev. Al Sharpton, who told people to make out checks to Fulton. "Let's show the world we're going to finance our own movement," said Sharpton, who pledged $2,500 of his own money. Sharpton's involvement as a family supporter has drawn criticism as an ethical breech because he also hosts an MSNBC show that is closely covering the case. Family attorneys also hired the marketing firm MediumFour, based out of Fort Lauderdale, Fla., to handle the hundreds of interview requests. The firm has set up a portal at the website WePay to receive donations, which totaled $19,000 on Friday. In addition, the family has drawn the support of the National Bar Association, an organization of black lawyers and judges. The group, of which Parks is president, has targeted the "Stand Your Ground" law in Florida and numerous other states in an effort to weaken the protections granted to those who claim to have used deadly force in self-defense. "This is a movement," said attorney John Page, the president-elect of the bar association. "But once the movement is over, we will still be in this fight to ensure that the application of these laws is equitable." Martin and Fulton join a growing number of parents who have taken up broader causes on behalf of victims after their own children have been harmed. The parents of Elizabeth Smart, abducted at age 14 in Utah in 2002 and found nine months later, lobbied aggressively for the National Amber Alert, part of a landmark child protection law passed in 2003. 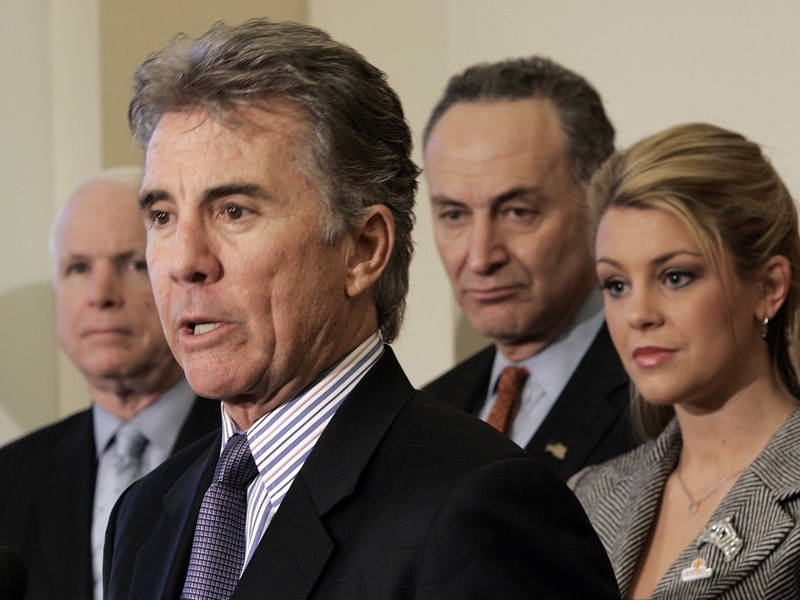 John Walsh, host of "America's Most Wanted," speaks during a 2007 news conference on Capitol Hill to discuss the Securing Adolescents From Exploitation-Online Act of 2007. Beth Holloway became as recognizable to the public as her 18-year-old daughter, Natalee Holloway, who disappeared while vacationing in Aruba in 2005. Holloway's outspoken criticism of the investigation made her a frequent presence on television. In 2011, she began hosting a television series on the cable network Lifetime. "Vanished With Beth Holloway" examines unsolved disappearances. But long before either of those cases captured national attention, the mold for this kind of parent activism was set following the kidnapping and murder of 6-year-old Adam Walsh in Florida in 1981. The boy's father, John Walsh, started a push for stronger child protection laws, including legislation that funded the creation of the nonprofit National Center for Missing and Exploited Children, co-founded by Walsh. Walsh is famously known as host of the crime-stopping television show "America's Most Wanted," the long-running series now on Lifetime. "There's this horrible club of parents of murdered children whose numbers have grown so incredibly over the past decade," Walsh says. "Some parents are motivated to take action by the sheer agony and pain and torture of losing a child." Another powerful driver is anger at not knowing exactly what happened to their child, how it happened or why the killer isn't in prison. A need for answers can consume parents, Walsh says, counting himself among them. They crave justice. "I think what drives Trayvon's parents is that they believe the criminal justice system has done them an injustice. It took 27 years to solve Adam's case," Walsh says, referring to an investigation notoriously hampered by errors that police eventually acknowledged.